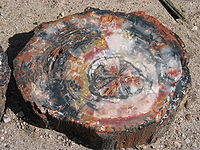 Petrified wood comes from the Greek root petro meaning "rock" or "stone"; literally translating to "wood turned into stone". It is the name given to a special type of fossilized remains of terrestrial vegetation. It is the result of a tree having turned completely into stone by the process of permineralization. All the organic materials have been replaced with minerals, mostly silica such as quartz while retaining the original structure of the wood. 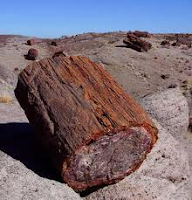 Unlike other types of fossils which are typically impressions or compressions, petrified wood is a three dimensional representation of the original organic material. The petrifaction process occurs underground, when wood becomes buried under sediment and is initially preserved due to a lack of oxygen. This inhibits aerobic decomposition. Mineral-laden water flowing through the sediment deposits minerals in the plant's cells and as the plant's lignin and cellulose decay, a stone mold forms in its place. In general, wood takes less than 100 years to petrify. The organic matter needs to become petrified before it decomposes completely. 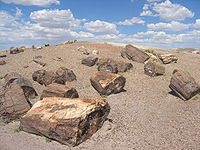 A forest where the wood has petrified becomes known as a Petrified Forest. 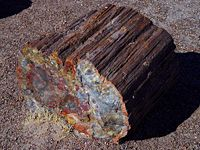 Elements such as manganese, iron and copper that are present in the water or mud during the petrification process give petrified wood a variety of color ranges. Pure quartz crystals are colorless, but when contaminants are added to the process the crystals can take on a yellow, red, or other tint. 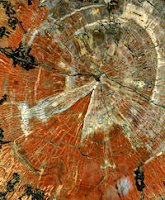 Petrified wood can preserve the original structure of the wood in all its detail, down to the microscopic level. Structures such as tree rings and the various tissues are often observed features. 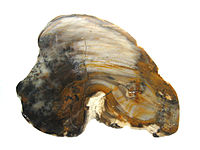 Petrified wood has a Mohs hardness of 7, the same as quartz. Petrified wood is the provincial stone of Alberta, Canada and also the state gem of Washington.